Fun song cow story, about a black and white cow who lived on a farm by a lake. She has many adventures, including a run-in with a mosquito, flies, mud, a puddle, and more, and by the end of the song she is a soggy, smelly, sneezy, ringing, swishy, noisy, dirty, munch, itchy, black and white cow! With its cumulative nature of lyrics it’ s great for encouraging memory and thinking skills and cognition. As an auditory experience also, children are encouraged to create their own pictures in their minds which builds imagination and creativity. 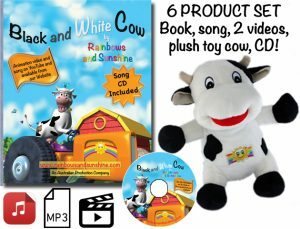 Appealing and humorous, we also have 2 quality 3D animated videos, a beautifully illustrated 24 page book (with CD) and a very cute plush toy cow to match the song. “Moooo” (who has various names in her many homes!) has proven popular with both children, furkids and adults! CLICK ON THE IMAGE BELOW TO SEE THE VIDEO WITH THE SONG SOUNDTRACK OF BLACK AND WHITE COW, PLUS PREVIEWS OF SOME OTHERS.